You might be dreaming about your images appearing in the next Whole Foods campaign or on the cover of Food & Wine magazine, schmoozing with big-name chefs around the world, and tasting spectacular dishes and drinks all day while you are filling up your bank account. That sounds fantastic, but only shows the tip of the iceberg. For most food photographers there is a bit more hustling and creativity needed to monetize their work and skill. 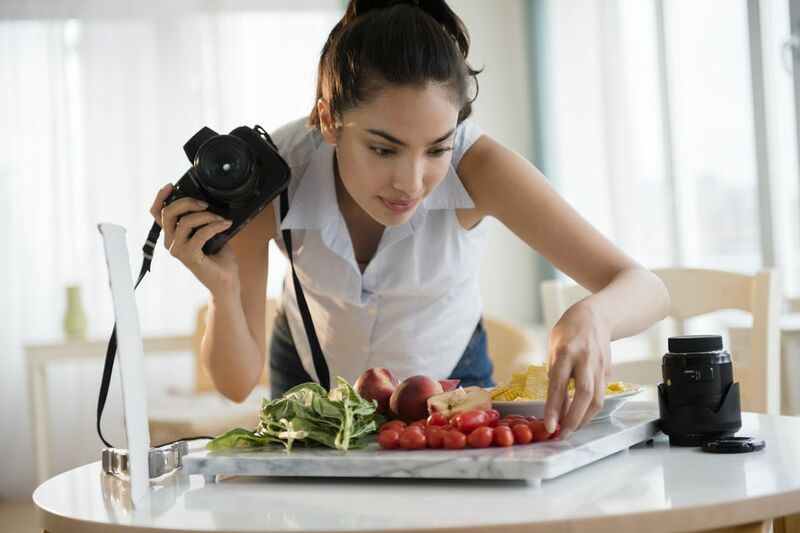 Learn how food photographers can make a living with photoshoots or talking about your work and skill via workshops, classes, speaking gigs, or blogging. Photographers can also make money by selling images as prints or stock. Most food photographers are independent contractors, but there are a few full and part-time food photography positions in publishing, media, and larger food corporations available. They are hard to come by and the work can get a bit monotonous over time. Clients can hire you as an on-demand in-house photographer to come into their office once a week (or month) and take care of their photography needs. There are plenty of arrangements with larger clients that offer stability and flexibility for the photographer. It’s best to negotiate a retainer or monthly project fee, so that scope, budget, and timeline are established in advanced. Food magazines such as Food & Wine, Bon Appétit, FineCooking, or CleanEating, to name a few, hire food photographers on a regular basis to shoot recipes, restaurants, or events for their print and online publications. And don’t forget about the smaller trade and niche publications -- online platforms like Epicurious, SeriousEats, and Food52, or giants like The New York Times have an endless demand for food photography. Editorial assignments are plentiful but usually have small budgets. However, they offer creative freedom and are excellent marketing tools. Art directors and buyers pay attention to the credit lines and often pick up names for advertising and other commercial shoots. From large food brands to your local restaurant, everyone in the culinary field (and beyond) needs quality food photography on an ongoing basis. Advertising needs to be fresh, the menu updated, and social media outlets are hungry for content. If you are just starting out take a look at your local restaurants, food producers, and industries. Introduce yourself and see if they have a demand and budget for your services. If you are expanding your career and are reaching for larger brands there will come a point when you need to consider hiring an agency to help you with your outreach, marketing, and negotiations. If you enjoy teaching and sharing the technical and artistic sides of photography locate a photography school, college program, culinary school, or food media association that offers (or should offer) food photography classes. You can always pitch your class and curriculum to an institution for their upcoming semester. Keep in mind that you might not have a kitchen, food stylist, or ideal lighting situations and figure out how you can work around those issues. Of course, you can also teach online via CreativeLive, Skillshare, or Lynda. The advantage of teaching at an established institution (or website) is that you don’t need to worry about marketing, they’ll get the word out and the students in for you. Teaching rates highly depend on your expertise, their budget, and your skills in negotiations. Many photogs learn best in a workshop or small class setting -- direct access to the instructor and input of other students can make all the difference. Teaching a weekend workshop in food photography with a food stylist at a studio with a large kitchen, good light, and plenty of props is the best, as you can set your own curriculum, timeframe, and price. Here the advantage is that you have complete ownership over content, but the marketing, organization, and registration process also falls into your hands. However, don’t underestimate how much time it will take to pull together an event like this. As an established and experienced food photographer you might want to tell your story, insights about the industry, or share advice at conferences, seminars, or events. Most likely you’ll start with unpaid speaking gigs to get your feet wet and build a few signature talks. Once you feel comfortable and have built your speaker history, approach food event organizers and look for opportunities. Most events book their speakers way in advance. Rates vary widely and again depend on your expertise, name recognition, their budget, and your skills in negotiations. You will likely find that speaking is an important element in marketing your services as well. It seems as though there are already a million (or more) food blogs out there, but you can still create one that’s better or in your niche that can be successful. Making money from blogging works through ad sales, sponsorship, product sales, or donations. First establish your topic, a blogging and marketing routine, and start building your audience. It takes time and effort to build up momentum but once you have some traction, followers and page views will be high enough that you can approach businesses about ad sales and sponsorships. If you gain a loyal following you can offer your own product and services as well.